Every so often, a paper comes along that contradicts your gut feeling and/or current practice and makes you really think hard. That happened to me this weekend. You may have previously seen or heard us in Virchester espouse the virtue of thromboprophylaxis for ambulatory patients immobilised in temporary plaster casts1. This was built initially on rare but emotive clinical experience of young patients coming to serious harm or death as a result of venous thromboembolism following temporary immobilisation. Our practice then developed through literature review2, evidence appraisal3 and national guideline development4, leading on to later posts1 and recent RCEM FOAMed podcast discussion. The evidence was never perfect in this area, but the balance overall appeared to suggest benefit from thromboprophylaxis. Several other regions around the country had developed similar practice. A Cochrane review had been published in favour of thromboprophylaxis. Things seemed to be moving in a single direction. This was a project designed to answer the ongoing clinical uncertainty around thromboprophylaxis following daycase arthroscopy, and the separate cohort of temporary immobilisation in plaster for those patients with lower limb injuries. Both groups needed to be deemed safe for immediate discharge and outpatient follow up to be included. This was an elegant study recruiting large cohorts of the above patients across 8-10 hospitals over a period of 4 years, and reporting both study results simultaneously in this article. For the rest of this post, we will concentrate on the plaster cast patients only, described in the article as the POT-CAST study group. SOUNDS INTERESTING – TELL ME ABOUT THE DESIGN AND METHODS. This was a prospective multicentre randomised controlled trial across 8 sites in the Netherlands. 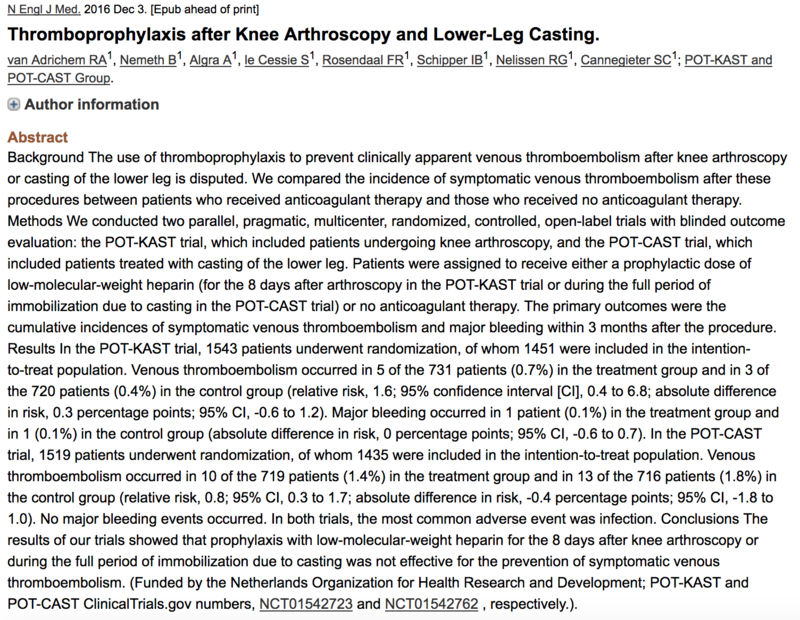 Patients with lower limb casts were screened in the ED and only excluded if they had a personal history of VTE, a contraindication to heparin, were currently anticoagulated or pregnant. After invitation and consent, patients were randomised by stratified permuted block in a 1:1 ratio to receive prophylaxis with daily subcutaneous LMWH, versus no prophylaxis, for the duration of the plaster. Clinicians could use either dalteparin (2500U provided patients weighed <100kg) or nadroparin depending on preference. The study was open label; clinicians and patients knew who was getting prophylaxis and who wasn’t. Allocation concealment was maintained through stratified randomisation by centre, only available to the researchers via computerised platform following written consent. The research team expected an event rate in the control group of 2% and powered to detect a relative 85% reduction in risk, with an industry standard of 80% power and alpha of 0.05. This equates to an expectation that they were expecting to see an event rate of 0.3% in the intervention arm, or an ARR of 1.7%. They accounted for dropout and calculated a requirement of 750 patients in each group total, to eventually provide the necessary sample size of 1250. Outcomes were predefined as symptomatic VTE and adjudicated by an independent committee blinded to intervention. Bleeding was also predefined and recorded as a primary safety and secondary outcome. LET’S HEAR THE RESULTS THEN – PRESUMABLY THIS PROVED WHAT YOU’VE BEEN SAYING ALL ALONG? Well, no. Not really. The investigators did really well with this trial, enrolling over 1500 patients during the recruitment phase. A total of 1435 patients were suitable for the intention to treat analysis after exclusions, and the investigators saw a 1.8% event rate in the control group, comprising 8 DVTs 4 PEs and 1 patient who had both. As expected really. However, there were also 10 symptomatic events adjudicated in the treatment group, giving an event rate of 1.4%, a relative risk of 0.8 (rather than the 0.15 predicted) and a non-significant absolute risk reduction of only 0.4% (95% CI of -1.8% to 1.0%). Only 3 events in total were avoided by giving thromboprophylaxis to 719 patients. Not that impressive really. This finding held up on a subsequent per protocol analysis of >1200 patients. There were no major bleeding events in either group and only 1 non major clinically relevant bleed in the intervention group. There was a single death in the conservatively treated arm, in a 90 year old patient, which the committee adjudicated may have been caused by PE. However, when the authors included this in a sensitivity analysis they still found no statistically significant reduction in risk with thromboprophylaxis. I SEE – ANY MAJOR FLAWS? Well, you can pick some holes if you look hard enough. The dose of dalteparin used for example is only half that recommended in the BNF; I think you can make the argument that the prophylaxis patients were significantly underdosed, and that we may have seen a further reduction in events if a higher dose or alternative agent had been used. You could also argue that the follow up was limited, as questionnaire and telephone evaluation only. If these patients were seen in a clinic, perhaps there may have been more discussion of symptoms and more imaging? However I suspect the authors would regard this as a relative strength – by following up in this pragmatic manner they should have only seen significant VTE outcome events as determined by patients, which are the chief concern of clinicians. Was this the right group of patients? Well, yes and no. The fairly broad inclusion criteria ensured a pragmatic and interesting cohort, with mixed risk spread out through randomisation. However, if you look in detail, you will see that over 40% of these patients had metatarsal fractures as their indication for immobilisation. In the UK many of these patients would be placed in a weight bearing aircast boot and so arguably would not be considered immobilised. This limits the generalisability of the study to allcomers. The authors also excluded above knee casts, therefore we cannot generalise to this group, who we would expect to be at higher risk with two joints immobilised. The definition of symptomatic VTE is always challenging, as all these patients have painful legs from the injury and so drawing out those worth investigating can get sticky. However, as an open label trial, you would expect this issue to actually increase the chances of a positive result; patients aware of the risks of VTE but not on prophylaxis would be more likely to present and get investigations than those on prophylaxis, with the result that more benign thrombi could potentially be found and recorded as symptomatic. An example of this issue potentially corrupting the data may be the distinction in the recorded location of thrombi; conservatively managed patients were 3 times more likely to be diagnosed with a distal DVT, compared to those treated with prophylaxis. There is no real face validity to this idea, other than the concept that patients may present earlier in their disease course if aware they are not on chemical prophylaxis, resulting in earlier diagnosis. The limited number of events makes interpretation of the results tricky also – if you calculate the fragility index of this study, you will find it is low – only 4 patients need to switch outcomes (leading to 17 outcomes in the conservative group and 6 outcomes in the prophylaxis group) in order for this trial to produce statistically significant results. Lastly, and perhaps most importantly, despite randomisation there were actually several relevant differences in baseline risk between groups. Patients receiving thromboprophylaxis actually had higher rates of obesity, smoking, oral contraceptive use, active cancer and family history of VTE. As such you can argue quite strongly that this group was likely to have a higher baseline VTE rate, rendering the chances of finding a significant difference less likely. RIGHT. UM, OK. SO WHAT DOES THIS ALL MEAN FOR THE SHOP FLOOR? Well, that’s hard. On the one hand, I would say that this is the best evidence on the topic that I have seen, and the take home finding is that in non-pregnant patients without previous history of VTE the incidence of symptomatic VTE following temporary plaster immobilisation is fairly low. It is also not reduced significantly by chemical thromboprophylaxis. Does this mean we can throw away the LMWH however? I am not so sure. This study confirms a symptomatic event rate of 1:50 for this cohort which is significant. It also has several issues that raise concerns about the idea of accepting this sole study as a definitive answer to the question. Multiple high risk factors warranted exclusion from the trial and so we are still unclear about whether these patients stand to benefit. The authors mention the need for further research on this subgroup in their conclusion. Well, if pushed I think I would stick to our previous position. Low risk patients with temporary imombilisation following lower limb injury seem to have a low VTE event rate and would seem not to benefit from thromboprophylaxis. The GEMNET guidance has always been clear on this. However, high risk folk are still a concern. As such a discussion of risk at the bedside and a shared decision making process is essential. How much risk is ‘high risk’? Well, this paper does move things on a bit, suggesting that in a mixed cohort of patients with active cancer, obesity, family history of VTE and smokers that thromboprophylaxis seems to be of limited benefit. Perhaps ‘high risk’, is actually much higher than we thought when we wrote the GEMNET4 guidelines. Perhaps predicting which patients in immobilisation are at risk of a subsequent VTE is impossible, as not all risk factors can be prospectively characterised. We shall see. No doubt there will be meta-analyses and logistic regression to follow from recent evidence. Until then, I intend to keep having the conversation. For those patients in low and middle ground of VTE risk I suspect I will dwell less on the equipoise and more on the low event rate. Therefore I would expect to be giving out less LMWH overall to these patients. 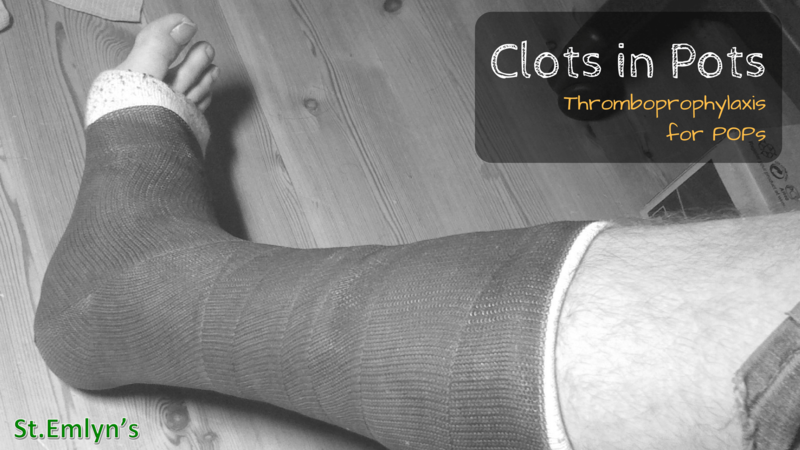 But that’s just me – I’m always interested to hear what you all do about the risk for clots in pots, and whether this paper will impact on your practice. The POP, the Chief, his risk assessment and her thromboprophylaxis. St.Emlyn’s. http://www.stemlynsblog.org/think-p-o-p-think-v-t-e-think-unlikely-to-get-h-i-t-then-think-h-e-parin/. Published October 18, 2012. Accessed December 17, 2016. The future of medical publishing. St.Emlyn’s. http://www.stemlynsblog.org/the-future-of-medical-publishing-st-emlyns/. Published October 2016. Accessed December 17, 2016. Is it a inertial practice not supported by strong evidence? Is it cost / effective/safe? In whom according to immobilisation times? In which kind of lower limb(below knee) injuries? Do fractures add extra risk vs ankle sprain? Is it the lmwh adjusted to the problem we try to avoid? What about drugs that could cause bleeding complications when added to lmwh? With regard to the RCEM flowchart, and establishing relative CIs to LMWH, does the flowchart imply that clinicians obtain an FBC (platelet count) or are these established through history only? This is still incredibly murky as to a way forward. There is, at my institution, a bit of a schism between EM (pro-VTE prophylaxis vs orthopaedics, who are less keen). They might be explained by the EM doctors being at the sharp end of the PE/patient harm in these emotive cases. With regard to decision-sharing with our patients, do you use the 1/50 number as a guide to how often DVTs develop or use a standard verbal script to ensure the patient has consented to VTE/no VTE prophylaxis? How do you quantify risks of bleeding? Do you utilise any stop & checks to ensure patients aren’t discharged without the VTE issue being addressed first? I’m working through a case with a bad outcome & am curious as to how other institutions are ensuring policies are adhered to and safety nets are in place.